Easy Company had been fighting 4 days. 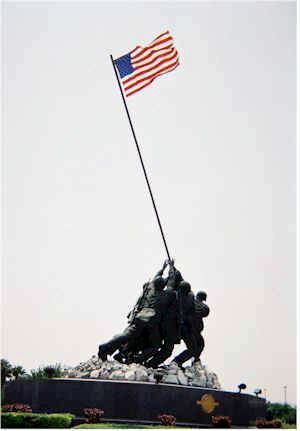 They had 40% casualties to date.On February 23rd, 1945 they were raising this flag on Mt. 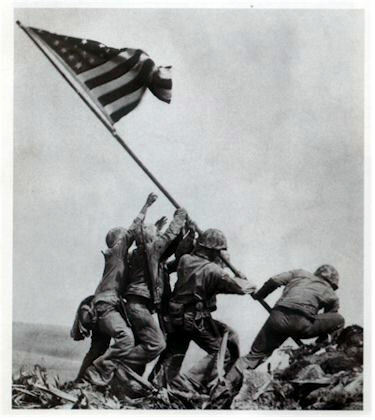 Suribachi when photographer Joe Rosenthal shot this the most reproduced photograph in history. Within hours many of these men would be dead. The flag raising photo caused an immediate sensation. Just two days after it was first seen in the US, Senators rose on the floor of the US Senate calling for a national monument modeled on the picture. The California State Legislature petitioned the Federal Government to build a grand monument. Thousands of ordinary American's wrote the President appealing for a monument to immortalize the picture they loved. Felix DeWeldon, an ambitious sculptor, had a clay replica of the picture sculpted within 72 hours of seeing the picture. Before the bronze monument could be cast a full size model had to be made. This original full-sized creation of Felix De Welden was used for the casting of the monument located in Washington, D.C. After completion of the monument in Washington, this sculpture was placed in storage until the early 1980's when it was donated to the Marine Military Academy in Harlingen, Texas by its creator. The Iwo Jima Monument is located behind the parade deck and near the main entrance to the Academy. The Academy is located adjacent to the Valley International Airport Harlingen, Texas. The Iwo Jima Museum is located adjacent to the monument and contains many souvenirs, photographs and memorabilia of the famous World War II battle. 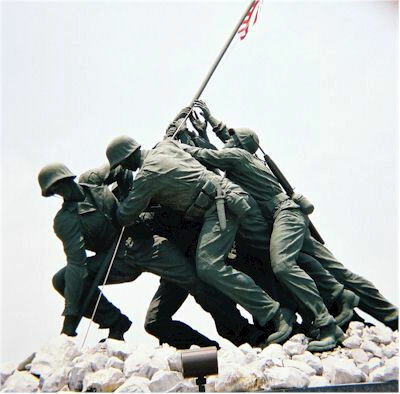 The Iwo Jima Monument - The Marine Military Academy, a Texas Original.